Lyme disease is an infectious disease that is caused by bacteria of the Borrelia type. It is transmitted to humans when they get bit by an infected tick and has it attached for more than 36 hours. 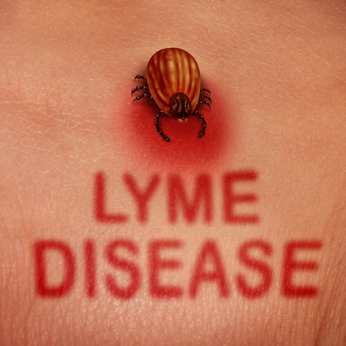 Lyme disease affects multiple systems in your body and displays a wide variety of symptoms. Many patients that have Lyme disease don’t show signs that are specific to the disease, but are specific to other diseases. The classic early sign is the circular, expanding rash called erythema chronicum migrans, which is found on the area you were bitten. The rash is red and can be warm, but it usually is painless. People who are infected may also demonstrate flu-like symptoms such as, headache, fever, and muscle soreness. Infections are most common in the spring and summer months, covering your skin with long clothes especially if you are out in places where ticks are likely to be, such as a forest or wooded area at those times. You may also be able to use pesticides to reduce the number of ticks around your area. Always remember to check yourself and others for ticks before going inside a house. If you find a tick on yourself or another person, do not pull straight off! Use tweezers and firmly grasp the tick as close to the head as you can. If the tick is filled with blood and removed improperly it could transmit some of the infected blood into yours. If infection occurs, a number of different antibiotics and medication are used to treat it. The standard treatment typically lasts for 2-3 weeks but it all depends on how bad the infection is.